Unfortunately our Senate has defeated efforts to strip controversial sections from the National Defense Authorization Act for Fiscal Year 2012 (scroll to "Detainee Matters" § 1032 et seq.) that will effectively institutionalize3 the lawlessness of Star Chambers1 resurrected during the reign of King Bush the Idiot2. Fortunately, President Obama has expressed a willingness to veto the legislation—he must do just that, notwithstanding plaintive pleas of balance and bipartisanship. strictly adhere to equal justice under the law, and rule of law. Summarizes our nation's unsavory and unseemly devotion to episodic, arbitrary and ad hoc torture and degrading and inhumane treatment of those deemed, divined and detained as "unlawful combatants", while pursuing a decade long "War on Terror". Report includes recommendations for ensuring such episodes do not recur and those authorizing and participating in prior episodes are held to account. So, let all governments with documents and information relevant to the decade long (and counting) Guantanamo debacle immediately begin providing them to an independent international investigation and prosecution tribunal for findings, determinations and final disposition. Unfortunately, our nation persists with its disastrous kangaroo kommissions and foray into kangaroo justice. Remembering that our CIA played a significant role in creating the Guantanamo debacle and that no proposal is too bizarre or blowback too disastrous for our CIA, maybe our "other government agency" will stage a one-time-one-hundred million covert operation to breakout the Guantanamo detainees, Abu Ghraib style. Our nation can conduct a propaganda campaign to blame the breakout on an " Al Qaeda affiliated terrorist group”--presto, no detainees, no Guantanamo, no accountability and a 2013 savings of $354 million dollars! Hell, with that much savings our "other government agency" can splurge and purchase some hydraulic hoses for the "escapees" to chew on during their flight to freedom! Mr. President, we don't even treat kangaroos like this—do we? First comes monitoring attorney-detainee communications with bugs that were turned off; now comes prosecutor's possession of privileged attorney-detainee e-mails that were not read; what's next, fixed verdicts that were not followed?! 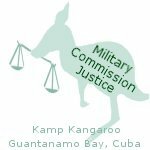 Guantanamo Kangaroo Kommission rule-of-law-sham implodes (again) after revelation that attorney-detainee communications have been bugged by an unknown and undisclosed operation and operator. Kangaroo Kommission participants are trying to figure out how to proceed after the latest implosion. Unfortunately, the kangaroo justice for these detainees will continue to harm our nation long after they've been found guilty and executed. A decade of American shame and listening to the kangaroo kommission konvening authorities et al. tell us how pretty the lipstick they've painted on the pig kangaroo looks. Fortunately, unlike beauty torture free definite detention, trial by regularly convened courts of law, equal justice under the law and strict adherence to rule of law4 are not in the eyes of the beholder. 1. Some of our current politicians, like their colleagues from history imagine they can create modern Star Chambers for narrow groups of individuals, thereby supplanting "equal justice under the law" and the "rule of law". Notwithstanding history repeatedly warns of the harmful folly that follows such imaginations. 2. King Bush the Idiot et al. added insult to injury by asserting that the torture inflicted on some detainees was justified by the alleged effectiveness of the torture. A new moderately redacted book by Ali Soufan title The Black Banners belies many assertions of torture's effectiveness. The Arabic speaking, culturally sensitive Soufan is a former FBI detainee interrogator (e.g.Abu Zubaydah). 3. UPDATED 12/04/2011 Additional information on this legislation (H.R. 1540 and S. 1867) can be found in Congressional Research Service Report R41920, Detainee Provisions in the National Defense Authorization Bills dated 18 November 2011. 4. Congress's custom made legislation for Guantanamo and its detainees is nothing more than an unconstitutional attempt to rule by law, albeit a "sincere, well meaning and noble attempt".